The Exchange Coffee House in Boston was a hotel, exchange, coffee house, and meeting space, which included a dining room and ballroom. It was designed by the architect Asher Benjamin and was built in 1808. The first meeting of the American Antiquarian Society was held in this building before finding a permanent home in Worcester. 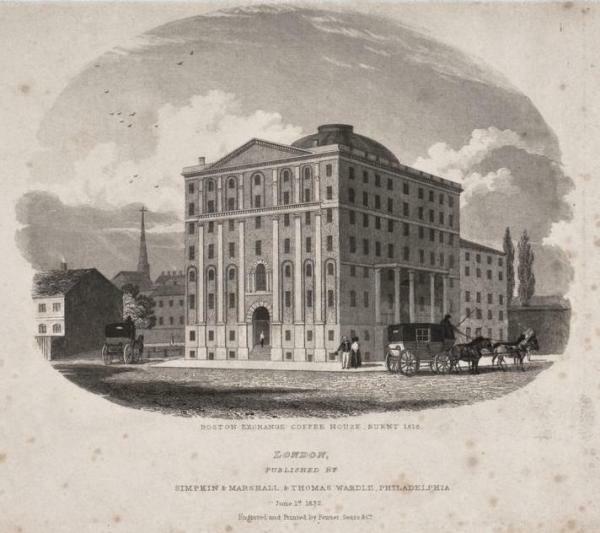 The Exchange Coffee House burned down in 1818. Exact Title: Boston Exchange Coffee House, burnt 1818. Author/Creator: Fenner, Sears & Co.